Boliche is a wonderful way to prepare an eye of the round. 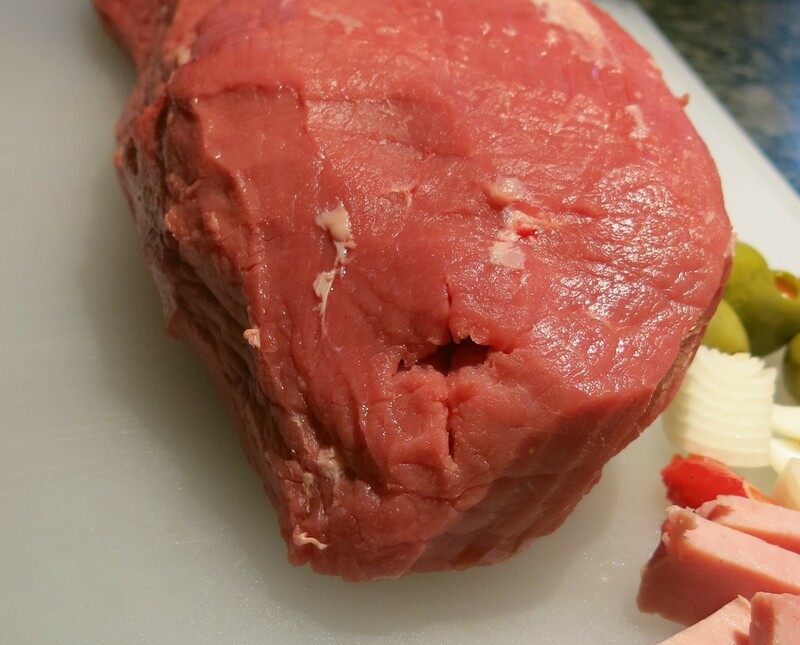 This is an extremely lean piece of beef, but with tons of flavor and a lovely little surprising morsel in the middle of each slice.Eye of the round can be a difficult piece of meat. There is a fine line between it being perfectly juicy and delicious and a dried-out piece of tree bark and about that tender. I try to use a slow-cooker, as I have found that the moist, low heat works pretty well with this cut, but you can still over-cook it, even in the slow-cooker. I’m giving you the recipe first, then I will explain certain steps with pictures after the recipe. This recipe is long, but this isn’t that difficult or time consuming really. 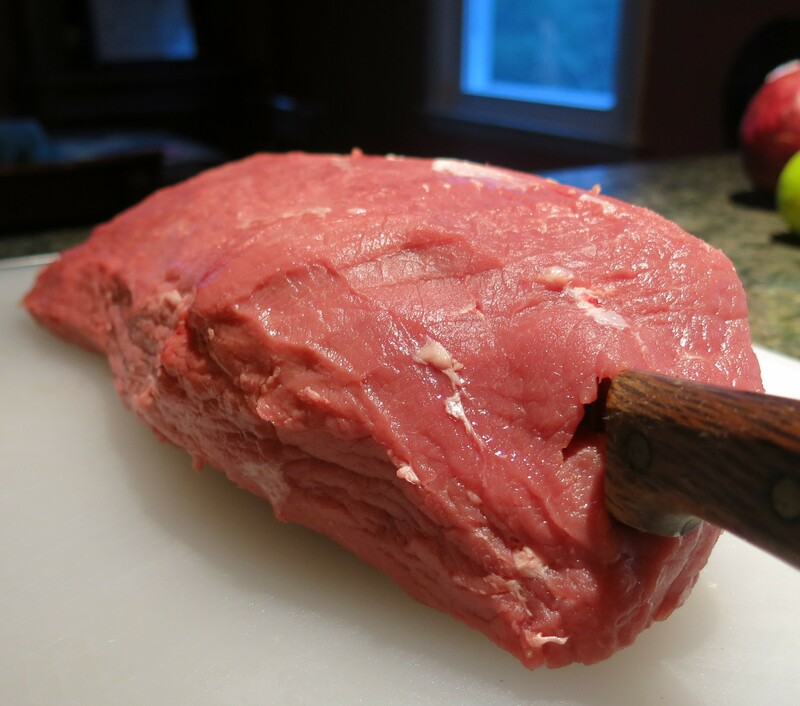 To make the “tunnel” for stuffing: Lay the eye of round roast on your work surface. Using a very sharp, straight long-bladed knife, insert the tip into the small end of the roast. Push the knife all the way through the center of the roast, keeping the knife in the middle of the roast. Rotate the blade 90 degrees and insert the knife in the same spot, creating an cross shape that extends through the roast. You should have a tunnel that you can insert the handle of a wooden spoon straight through to the other end. 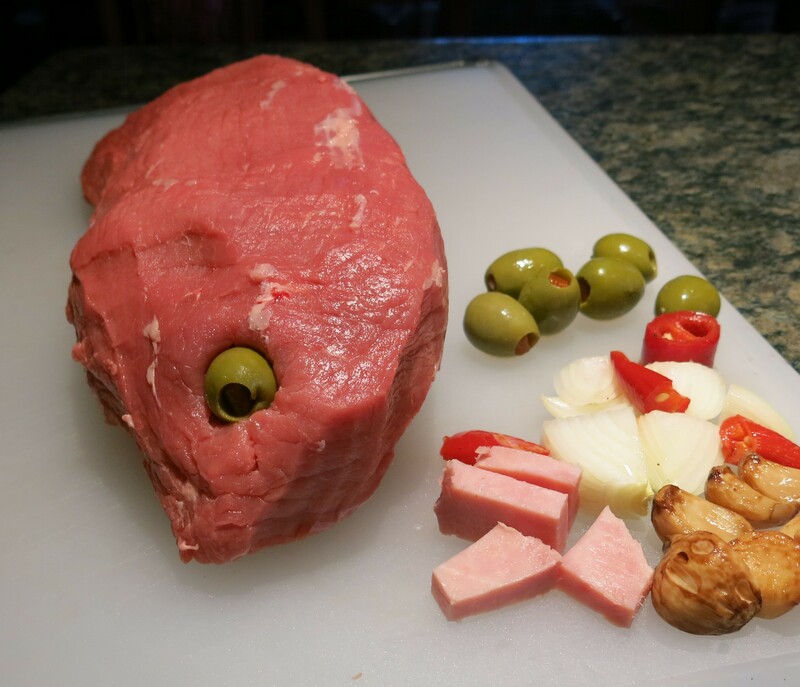 Using your fingers or the handle of a wooden spoon, insert the ham, olives, roasted garlic, if using, and onion pieces one after the other into the tunnel. It might be easier to work from both ends rather than going all the way through one way. Set aside. Heat a large Dutch oven or skillet over medium heat. Add the oil and place the roast in the pan; brown on all sides, about 10 minutes. Remove roast to a platter; season with salt, pepper, paprika, garlic granules and cumin; set aside. Stir in the onions, peppers and sliced garlic; cook and stir until slightly softened and the onions have turned translucent, about 5 minutes. Return the roast to the pot, add the bay leaves, wine, beef broth and raisins. Bring to a boil, cover and reduce heat to low; simmer 2 1/2-3 hours, adding additional beef broth as needed. Remove the roast and place on a platter. Cover the meat with two layers of aluminum foil, and allow to rest in a warm area for 10-15 minutes. 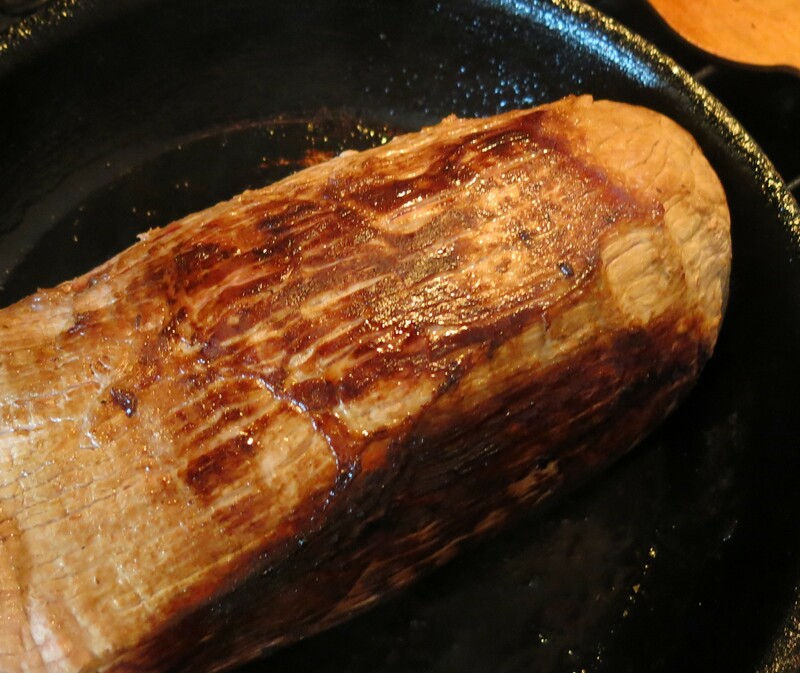 Slice roast into slight thicker than 1/4-inch thick slices. Gently stir the olives into the broth; spoon the remaining sauce over, and serve. To prepare in a slow-cooker: After the cooking the onions/peppers/garlic and deglazing the pan with wine and broth, pour this mixture into a large slow-cooker. Add the bay leaves and lay the seasoned roast on top. Cover and set on LOW. Cook for 4-4 1/2 hours, turning the meat once or twice. If you have a slow-cooker that shuts off at the end of cooking and switches to WARM, leave the meat on the warm setting for about 1 hour. Turn the slow-cooker off and let the meat cool to room temperature. Then continue as described above. COOKS NOTE: We like this made the day before, then reheated in some of the sauce, to help keep the meat moist. Boliche Recipe©Marcia Lahens 2014. All rights reserved. The very first thing you need to do is remove the silver skin. The silver skin (this is the tough connective tissue that lies under the fat cap that covers the muscle/meat) needs to be removed, as it will remain tough and unpleasant to eat no matter how long the meat cooks. It isn’t that difficult to do, once you get the hang of it. 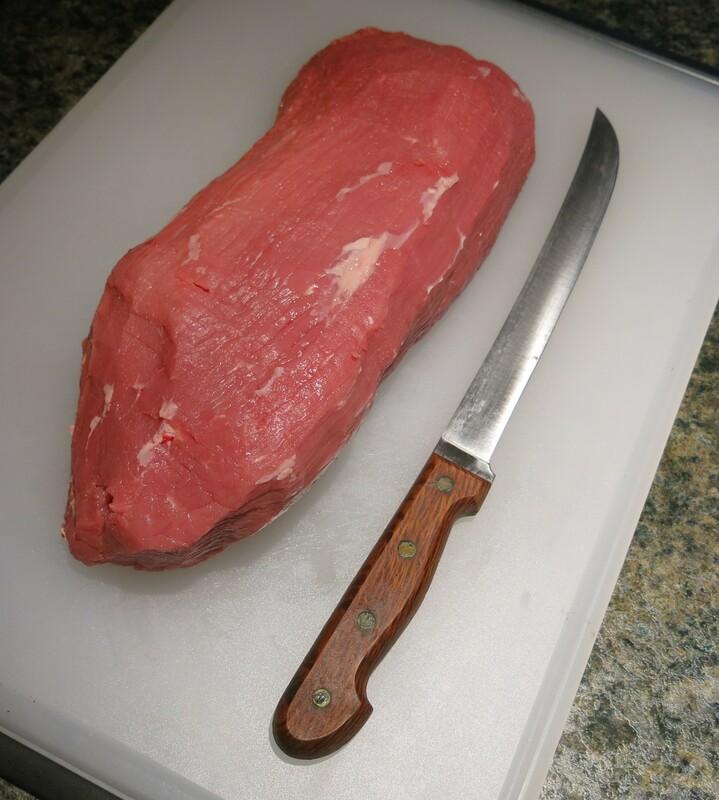 Your butcher can and will do this, but you should know how, just in case….You need a very sharp boning knife. Insert the tip just under the silver skin and holding the knife as a very sharp angle to the meat, cut the skin away, removing as little meat as possible. This sounds much more difficult than it is. Continue removing strips of the silver skin, until the roast looks like this! Now you’re going to make a tunnel through the center into which you are going to push/stuff some good flavor and besides, it looks very impressive when you slice it and serve the Boliche. You can see this knife has a very long blade and is razor sharp…keep all your knives sharp and you will be less likely to cut yourself. Remember, NEVER put you cooking knives in the dishwasher, but I digress…. 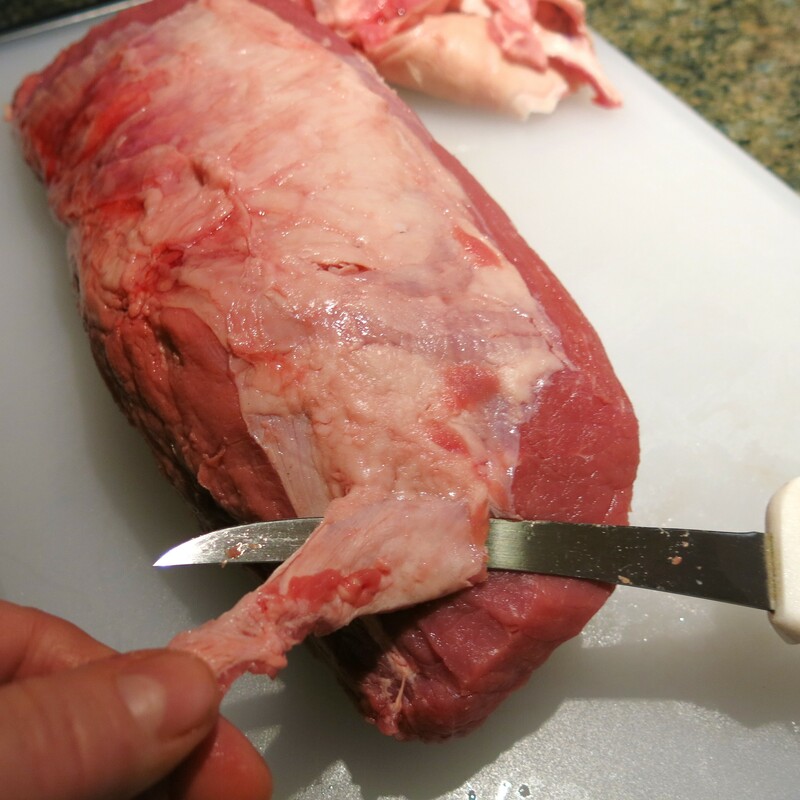 Insert the tip of the knife into the meat a push it through, keeping the knife as much in the center as possible. Then turn the knife 90 degrees and do it again. The end of the meat will have a cross in it and you are going to push all the good stuff into the meat. I use my fingers to do this, but the end of a wooden spoon works reasonably well. I’m using queen-sized olives, roasted garlic cloves, some pickled pepper pieces I had and chunks of onion and ham. 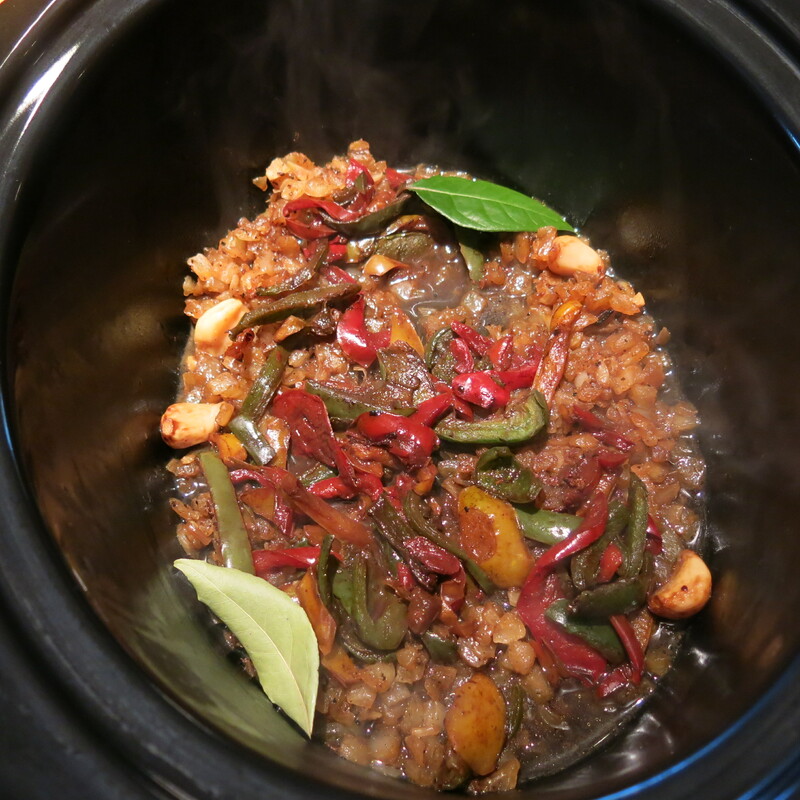 plunk the meat on top of mixture, cover and set the slow-cooker on LOW. Mine has a timer, so I set it for 4:30 hours; this is a 6 1/2 pound roast, but if you have a smaller piece of meat, you will have to adjust the cooking time. I figure about 30-40 minutes per pound of meat on LOW. My slow-cooker also has a feature that will keep food warm, so when the machine switches to WARM, I let the meat “cook” for about another hour. 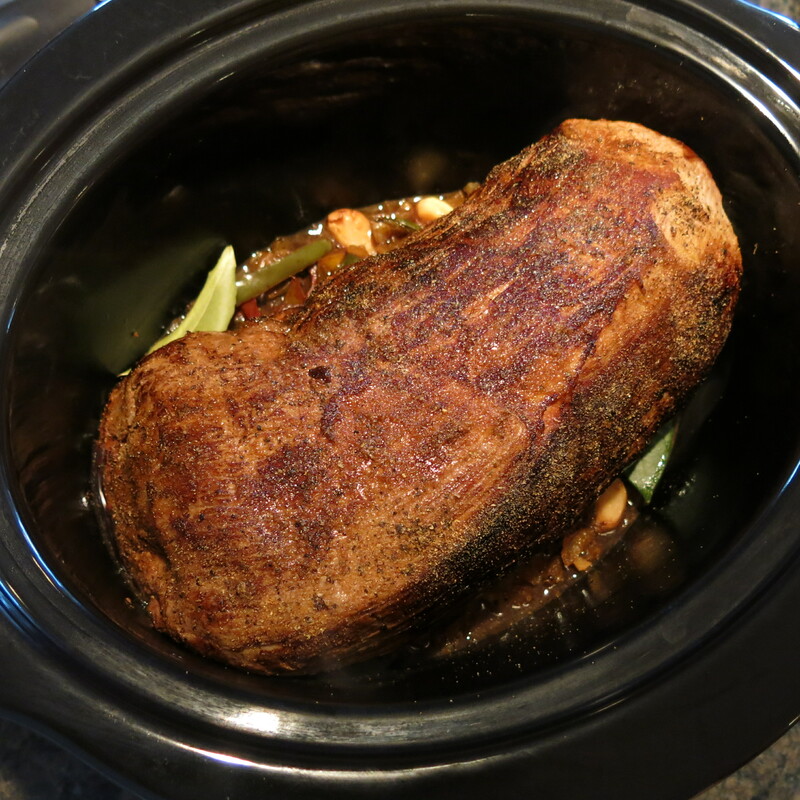 Then I turn off the slow-cooker and let the meat rest for about an hour. You can slice it and serve it now, but I prefer to do the cooking a day or two ahead, refrigerate the meat and reheat, using some of the liquid to keep it moist. A Word about Slow-Cookers: They are all different. Know how yours cooks. However, what I have discovered with these newer slow-cookers, is that you can actually cook on WARM. Newer slow-cookers cook “hotter” than older ones. I surmise it has to do with companies trying to avoid litigation, so they made the cooking temperatures higher on all the settings; in case someone gets sick and then sues them, which I am certain has happened. Therefore, I never use HIGH, but always the LOW/WARM combination when braising meats (that’s what this process of “pot roasting” actually is called…more on that another time). So that’s it…see that wasn’t as difficult as you thought and the flavor is wonderful. Just a note, I didn’t add raisins or olives this time; I got distracted and forgot, but The Latin Lover ate it all up and didn’t miss them at all. He’s still smiling with satisfaction. 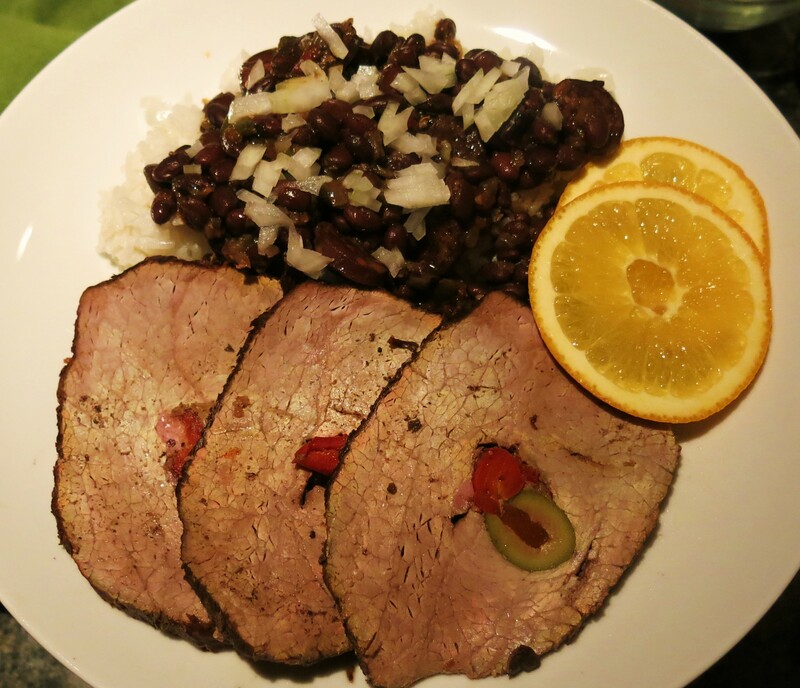 I usually serve Boliche with frijoles negros, rice and mojo. A wedge of lime or some orange is nice, too. Sometimes I serve tostones (fried green plantains) or platanos maduros (ripe plantains) on the side.